Eric loved to swim in the sea. Each morning after breakfast he'd put on his swim trunks and walk down to the beach. He'd spread out his towel on the sand and then run into the water for a swim. His mother always went with him and she'd sit on the beach and watch him as he splashed about in the water. One morning Eric swam out a little further than he usually did. The water was much deeper. “Eric, come back here. You're going too far out!” His mother stood and shouted at him. Eric didn't hear. The waves made a loud noise. Something brushed by his leg, rubbing it. “What was that?” Eric stopped swimming and looked around. “Mom! Something's out here with me!” He shouted and turned to swim back to the beach. A long, green, scaly bump rose out of the water. Eric watched in horror as another hump poked out and then another and another. Soon there were six humps. “Mom! Help me! It's a monster! It's a sea monster!” A tail with a spike at the end crept out of the water like a dancing cobra. “Yikes!” Eric gulped and then swam with all his might towards the beach. Two sharp purple horns rose from the water right in front of Eric's face. A pair of bulgy eyes and a snout with sharp teeth raised up. A loud roar gushed from the creatures mouth. Eric swam faster, trying to get away from the sea monster before it ate him. Mom saw the sea monster swim under Eric and lift him out of the water. 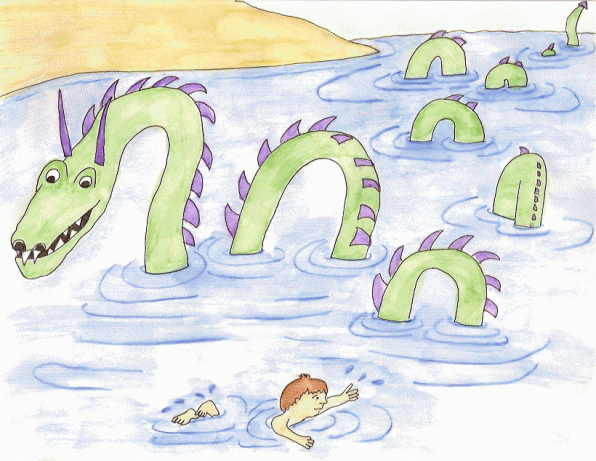 Eric grabbed onto the sea monster's purple spikes and held on as it swam towards the shore. When it got close to the splashing waves, it rolled over and Eric fell off. His mom rushed into the water to help her son out. “You're all right, Eric. The sea monster saved your life.” His mom put a towel around him and held him tight. The two of them stood staring out at the water. The sea monster smiled at them and dove under the water, disappearing forever. “Tomorrow when I come swimming, I'm staying close to the beach,” Eric said. “It's a good thing that sea monster was out there to save you, wasn't it?” His mom put her sandals back on. “Yes, Mom, but I'm never going out far in the water again.” Eric slipped on his shoes and the two of them walked home. Eric stood at his window that night staring out at the sea. “There really is such a thing as sea monsters.” He whispered through the window pane. Just then he saw the humps appear, glowing in the moonbeams. “Thank you!” Eric waved, knowing the sea monster wouldn't see him or hear him and then he went to bed, glad to be alive.